that, along with another woman whose name he could not recall, 'Beatrice' was part of the Nuremberg Prosecution team. Later, another source relayed a story that 1 of the women at Nuremberg was married to a male prosecutor, a fact the couple tried to keep quiet. Sleuthing's led us to believe that Ferencz might've had in mind Cecelia H. Goetz, a New Yorker who appear ed before the bench during the "industrialists" trial of Alfred Krupp. Other names of women prosecutors at Nuremberg also have surfaced: Phillis Heller Rosenthal, Belle Mayer Zeck, and Mary Kaufman. Were those 4 all the women who prosecuted at Nuremberg? These are Americans -- did women work with the Russian, English, or French teams? And what of "Beatrice"? According to a slim but excellent volume I picked up this summer at Nuremberg, the answer to the 1st question quite clearly is "no." The only 1 of those "3" prosecutors whom Heigl gives a name is altogether new: Dorothea G. Minskoff, pictured above next to a defense attorney at a Ministries case hearing. No other names're mentioned, nor any more information given. A 1948 directory of IMT personnel, however, provides additional clues. Goetz is listed, as is to be expected, and Mary Kaufman, too. But the only Mayer was named Hilde, and neither Heller nor Rosenthal is there. An interesting find: the listing for Dorothea G. Minskoff reveals her at the same address as Emanuel Minskoff, a prosecutor in the I.G. Farben case. Is this the couple mentioned in the story above? Even more intriguing, 2 women named Beatrice served at IMT in 1948, Beatrice E. Benford and Beatrice O. Bushnell. Might 1 be our "Beatrice"? 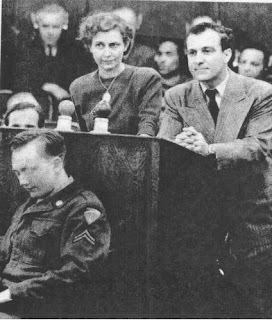 Still to come in this Women at Nuremberg series: Staffers, Press, Witnesses, and, alas, those Defendants. Yes, Dorothea and Emanuel Minskoff were married. ¡Pero está la Comisión, sí!